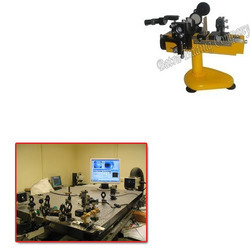 Leveraging by the vast experience in this domain, we are engaged in manufacturing and supplying the best quality of Michelson Interferometer for Optical Labs. Available with us at cost effective prices, the offered michelson interferometer is highly demanded in various optical laboratories. Our large michelson interferometer production capacity, has helped us in meeting the bulk demands efficiently. Lead Screw: Lead screw is optically ground with its nut. Optical Mirror Mount: Kinematic mirror mounts are to hold the mirror which be aligned in to orthogonal direction by means of screws provided at the rare of the mount. Beam splitter and compensating plates are covered from the same optically worked glass plate. Looking for Michelson Interferometer for Optical Labs ?